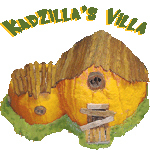 Home » art , art-I-made , blogging , FarmVille , Kadzilla , personal » A New Avataar... KADZILLA! The wise have said that "like attracts like"... and that's exactly what happened with FarmVille and "Kadzilla's Villa". The immense amount of creativity surging through something as trivial as a virtual farm unleashed the creative forces within me too! And the result was this blog networking website, that would not only allow me to practice and showcase my web development skills, but, also serve some actual purpose out there on the 'www' -- a live project with practical utilization, rather than just a useless amateur production occupying web space! This 'common room' of the "Villa" -- an e-zine for the bloggers -- was originally meant to be launched as a team effort, back in April 2010, under a different name, along with three other bloggers. But, the so-called "team" was a disaster from Day One! Not all partnerships are meant to survive you see. We learnt our lesson too! The team split, they decided to go with a completely new look & theme, and I couldn't bear to see all my hard work go down the drain. So I decided to re-launch the e-zine with a different intention altogether. 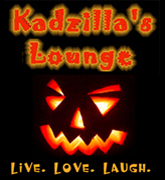 As you can see, I have tried and tested a lot of CSS and designing stuff on "Kadzilla's Lounge"... including all those logos on the main page. Yes, they are all made by 'yours truly'! :p (Didn't I just tell you that FarmVille brought to surface my latent creative talent?) And this e-zine, along with the Villa, will now occupy the prime place in my online portfolio - "Kasin's Online" "Kadzilla's eStudio" "Kasin Websoft". So there folks... enough of ranting about my professional (ad)ventures! Please accept my formal apologies for suddenly going off the grid without any information. As you can see now, I went off for a good cause.